Rabbi; born 1829 at Neustadt-Sherwint, Poland; died Nov. 23, 1899, at Riga. Educated at the yeshibah of Georgenburg and at the rabbinical school of Wilna, he was called in 1859 to the rabbinate of Mitau. As a rabbi Pucher received from the government the silver and the gold medal of merit. In the sixth decade of the nineteenth century he bravely opposed, in speeches and in written articles, the Christian-Jewish mission in Courland, thereby creating it great sensation. He labored with tact and discretion to obtain civil and political rights for the Jews, and in 1864 he was called to St. Petersburg as a member of the commission for securing the right of residence to Jewish workmen. About twenty years later he wrote and presented to Count Pahlen, chairman of the Jewish commission, who was staying in Courland, a detailed memorandum in their favor of the condition of the Jews. His efforts to improve their status represent a portion of the history of the Jews not in Courland only, but in Russia generally. With equal energy he worked to develop the inner life of the community. He labored also for the religious education of girls, establishing confirmation classes for them; and he gave the boys free religious instruction in the gymnasium. In 1893 he accepted a call as rabbi to Riga, Russia, where he labored till 1898, when he retired from public life. The community at Riga raised a large fund in his honor, the interest of which is used for the benefit of widows and orphans. 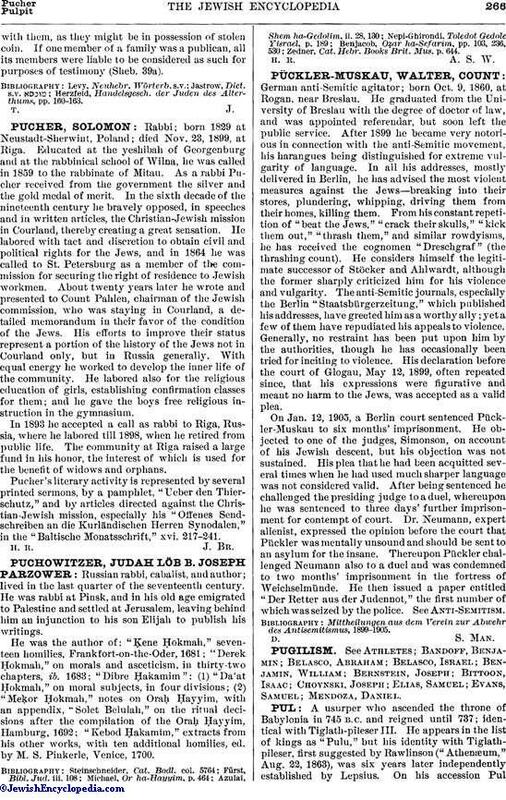 Pucher's literary activity is represented by several printed sermons, by a pamphlet, "Ueber den Thierschutz," and by articles directed against the Christian-Jewish mission, especially his "Offenes Sendschreiben an die Kurländischen Herren Synodalen," in the "Baltische Monatsschrift," xvi. 217-241.